There is a growing feeling among young people today that we have been lied to by those in power. Throughout our time in school, we were constantly reminded of the value of caring for the environment. We were taught about the importance of biodiversity, recycling, and water conservation. And so, we committed ourselves to turning off the lights when leaving a room, taking the bus, cutting down on meat intake, and recycling our plastics. However, through all of that, carbon emissions did not decrease, or even level out. Instead, they grew year on year, to the degree that there are now more greenhouse gases in the atmosphere than at any point in human history. In addition to that, Ireland is all but certain to miss its 2020 emissions targets, and we are facing the first mass extinction in 65 million years. Given the urgency and severity of climate change, it has become clear to most environmentalists that the radical change necessary won’t come about through traditional politics. Laying the facts in front of politicians and appealing to their better nature hasn’t worked thus far, and it won’t work now. It’s increasingly clear that a large-scale, grassroots movement is necessary to demand government action. This brings us to the School Strike For Climate movement, also known as Fridays For Future. Late last August, 16-year-old Swedish student, Greta Thunberg, sat outside the Swedish parliament every day until the general election in order to protest her government’s failure to reduce carbon emissions. Her message was simple, with a sign reading Skolstrejk för klimatet – school strike for the climate. Thunberg’s small protest has now sparked a global movement led by students, where they skip class on Fridays in order to protest government inaction on climate change. Australia was one of the first countries to mobilise, where students were only encouraged by the snivelling condemnation from Prime Minister, Scott Morrison. Germany soon followed, with an estimated 30,000 protesters across the country. Switzerland soon surpassed that, with a staggering 65,000 people on February 2. Irish students joined the movement in mid-February, with hundreds gathering outside the Dáil. Increasingly, university students have also been joining the protests, and they’ve been growing from strength to strength. In fact, fridaysforfuture.org have a map, showing all the locations School Strike For Climate protests have taken place, from Nairobi to Chicago to Tehran to Cork. 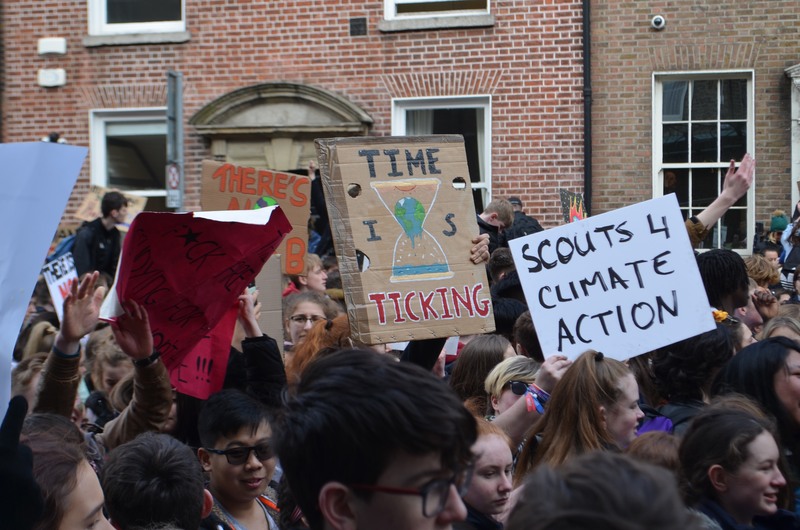 All of this came to a head on March 15, as tens of thousands of students across the globe, including some from Trinity, descended on government buildings to demand climate action. In many ways, it’s the movement environmentalists have been waiting years for. And rightly so. It’s likely we’ll see an Arctic Ocean ice-free in a matter of decades, and huge areas of land made entirely uninhabitable by temperature rises. It’s entirely possible that an infant born today could live to see a sea level rise of four feet. All the while, we’re being told that we, individually, are the ones responsible for this chaos. In our hubris, we’ve been using disposable straws and driving polluting cars, to the detriment of the planet. Interestingly, the politicians who push this rhetoric are often the same ones who vote against or actively sabotage legislation which cracks down on the 100 companies that are responsible for 71% of global emissions. We aren’t all equally responsible for climate change. The students of today weren’t the ones who ignored the evidence of climate change since the 1970s, and allowed employees of petroleum companies to work in the Department of Climate Action. We’ve been let down, and we are entirely justified in our anger. There is also the issue of optics, to which students are invaluable. In many ways, scientists aren’t the best advocates of climate action. Often, talk of biofuels and carbon sequestration can sound tedious and frustrating, often failing to convey the urgency of the situation. A far better face for the climate justice movement are students who don’t want to live on a dead planet, destroyed by corporate greed. Finally, it’s necessary to address the fatalism so often felt when discussing climate change. In the face of such a massive global problem, it’s easy to feel powerless. Many simply believe that the reforms necessary to tackle environmental destruction are unrealistic and unattainable. A recent example of this is when US Democratic Senator, Dianne Feinstein, lectured a group of student activists on the Green New Deal reforms, saying: “I’ve been in the Senate for over a quarter of a century…and I know what can pass and I know what can’t pass.” The problem is, “it can’t happen, what’s the use trying?”, is a self-fulfilling prophecy. If there is a reason why these reforms can’t take place, it’s because people like Feinstein have given up before the fight has even begun. It’s one thing to believe that we need to act on climate change, but it’s another to take political action. It’s strange to be living in such a crucial time for the future of humanity – but here we are. If we want to save, not just our future, but the future of generations to come, we as students need to make our voices heard, because in a matter of years, it could be too late.